Stresses are manifested in the ubiquitous grade portal that gives students constant access to their successes and failures. WHS students are no strangers to high expectations, competition and rigorous academics. There is a compulsive need to know where you stand at all times. But at what point does this constant competition do students more harm than good? WHS is one of the top thirty best high schools in the state, according to usnews.com. But in its efforts to maintain excellence, social comparison has become a widespread issue. Journalist, author and public speaker Malcolm Gladwell refers to it as relative deprivation, in which people evaluate their worth by comparing themselves with others. “The more elite an educational institution is, the worse students feel about their own academic abilities,” wrote Gladwell in his book David and Goliath: Underdogs, Misfits, and the Art of Battling Giants. Gladwell’s findings are supported by a 2007 study, “The Culture of Affluence: Psychological Costs of Material Wealth,” in which researchers noted that children of affluence are more likely to develop anxiety and depression, due to pressures to achieve. Let’s consider one of Westfield Public Schools’ mottos: “Tradition of Excellence.” This message printed across nearly every WHS pamphlet, presentation and web page seems encouraging, but in reality, it sets a bar that students should always reach “excellence,” according to some high schoolers. To junior Logan Calder, the motto reminds and expects “you to go on to a good college, [get] a good education and a good job.” However, the attainability of reaching this state of “excellence” is questionable. “It causes people to think that they have to be the best and it leaves no room for slipping up because excellence is what you always have to strive for. It shows what the school environment is as a whole and that everyone has to be the best–but not everyone can be,” said junior Greta McLaughlin. This motto serves as a lens for examining the mentality of our affluent town; there is a pressure for students to do better than peers and their parents and to amass more rigorous classes and extracurriculars than the student next to them. For incoming freshmen, the competition and stresses of high school are familiar. “[The competition started in middle school because teachers] say high school grades count and so does everything on your resume,” said freshman Lili Demerdjieva. “I feel like kids want to cram it all in there so colleges will look at them.” And cram, they will. The result: a toxic feeling of incapability and lack of intelligence for not subscribing to an academically rigorous regime. You should have, but you didn’t. So what about those who choose a different path? The general Westfield definition of a “good, competitive” school equates to an Ivy League or one of its cousins. “If I were to label good schools, I would say it’s the Ivy League schools that are really good, and bad schools are community colleges,” said freshman John Gonzalez. The college bumper stickers, sweatshirts and chatter that begins in ninth grade have infiltrated students’ minds as to what the “right” college is; the pressure to be accepted into elite universities can often mean competition among classmates and friends. Bs on the grade portal can be troubling to the eyes of parents and students, which invites the question: What is so wrong about a B? 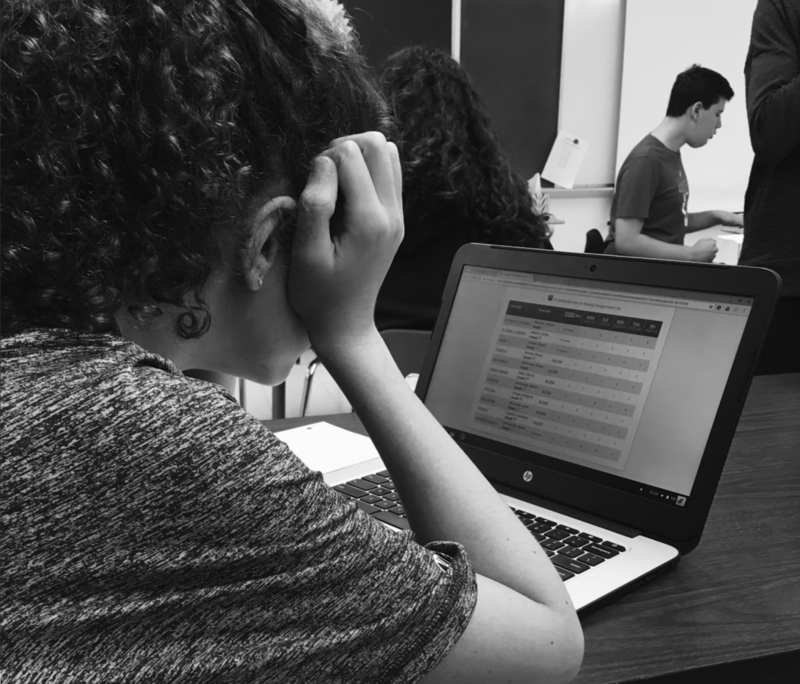 Earning a B is characterized as a “high quality achievement” on WHS report cards, but it is often translated to failure in the typical WHS mind. An A, or “excellent achievement,” is what you should get. Parents certainly mean well – it’s only natural that they want the best foundation for their children’s success. But a formulaic, one-size-fits-all approach to reach success, as defined by the characteristics above, can be destructive to a student’s self-esteem and authenticity. Being a well-rounded student is difficult when excelling at school feels necessary for self-worth. So some students participate in activities, interested or not, to play the part of the well-balanced citizen. Many students’ genuine interests and personality developments can be surrendered for what they believe a college wants. “I’m part of the Environmental Conservation Club at the moment – primarily because I think it’s going to look good on the college application,” said an anonymous junior, Student B. You don’t have to, but you should. In our conversation with Mazzarese we talked about the tyranny of the shoulds: I should do this, because if I don’t, I failed. This inevitably fuels social comparison and subsequent student stress. We can change this mentality through language. Mazzarese said to “replace the ‘shoulds’ with ‘I might’ and ‘I’ll try’; if you get it, great, and if you don’t – well what’s the takeaway?” With this mindset, students are more inclined to explore a new avenue that they are interested in, building resiliency, and not because they are pressured to do so. Shifting the focus from others’ achievements to your own potential is instrumental in embracing one’s own abilities. School doesn’t have to be a competition. After all, we are here to learn. As seniors, we’ve experienced and witnessed social comparison and its reverberations in the student body. Through countless interviews with students, parents and administration, many were relieved that this topic was finally being addressed. After a month of researching, we realized that this is a mission that everyone can work to solve – but it’s our choice if we want to be the agents of change. You are more than your grades, transcript, or future college. You are enough. Great topic. Great article. I hope it is the beginning of a bigger conversation. In my humble opinion, mental health must come before grades.